What does a Science Communicator do? A science communicator finds ways to explain what are sometimes complex science concepts in a clear, easily digestible manner. I work with over 50 000 kids each year and aim to inspire the next generation of scientists, enabling them to build the confidence they need to take risks and become lifelong learners. As a science communicator, I spend my days working with kids of various ages, helping them to realise the links between science education and the future world within which they will live. Science, innovation and technology are the backbone of Queensland’s economic future, and we need our kids to understand that science is all around them, and that science is beautiful. I teach science by allowing the kids to actually do some meaningful science investigations, which hopefully inspires a few of them to go on and study STEM subjects at a higher level. I’ve setup a business called Street Science which has enabled me to bring together a group of like minded individuals, which allows us to impact tens of thousands of kids annually. I now have over 10 staff who work with me to get kids excited about science education. We rock up to a venue with a dewar of liquid nitrogen, a tank of hydrogen and a tub of other chemicals and SHOW our audience how incredible science can be. After completing my undergraduate degree in Applied Science (Environmental Science) at QUT, I worked in the field for a few years before going back to uni to complete my Graduate Diploma in Education. After spending 7 years in the classroom working with hundreds of keen students, I decided to make a change and work with a different group of students each day. I setup a business and now travel the country teaching engaging science my way! Its’ the best job in the world! As mentioned, I have an undergraduate Bachelor degree in Applied Science and then a Graduate Diploma in Education. I am essentially a high-school science teacher who has taken my trade out of the classroom and onto the road. Every day that I go to work I get to work at a different location and with a different group of kids. I take a lot of pleasure out of seeing kids smile, laugh and cheer as they learn about science. At least a couple of times each week, a kid will say to me this is the best day of my life, and that’s because I’ve given the group an opportunity to access science that they otherwise wouldn’t have been exposed to. I’ve been running Street Science since 2012 and have already had a heap of highlights. 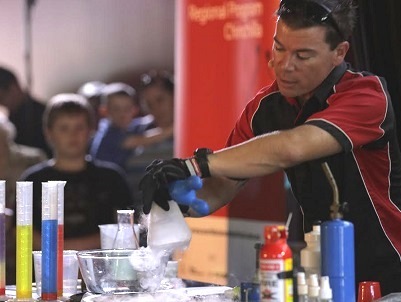 Earlier this year we helped the Chief Scientist smash a Guinness World Record for the largest Practical Science Lesson in the world, we performed at the World Science Festival in Brisbane, sold out an adults only event at the Queensland Museum and every day I make kids smile and enjoy their learning. That’s not a bad highlights reel! believe experience working with kids in a classroom environment is crucial to being able to communicate with this age group effectively. Consider a Masters of Science Communication (outreach) after completing a Bachelor of Science at university, and when you’re finally qualified hit me up for a job! Who knows how big Street Science will be in another couple of years!